UA 613 Grigio cenerino scarfo, sovrastructure ed armament (Light grey). UA 614 Grigio scuro bande mmetiche irregoluri sur UA 613. UA 615 Grigio Piombo Ponte, ponti e zoccolo paratie verticali. UA616 Rosso Mattone, Bande di identificazone. UA617 Verde Scuro Antivegetavio carena –opera viva. UA618 Legno ChiaroTeack Ponti in legno. 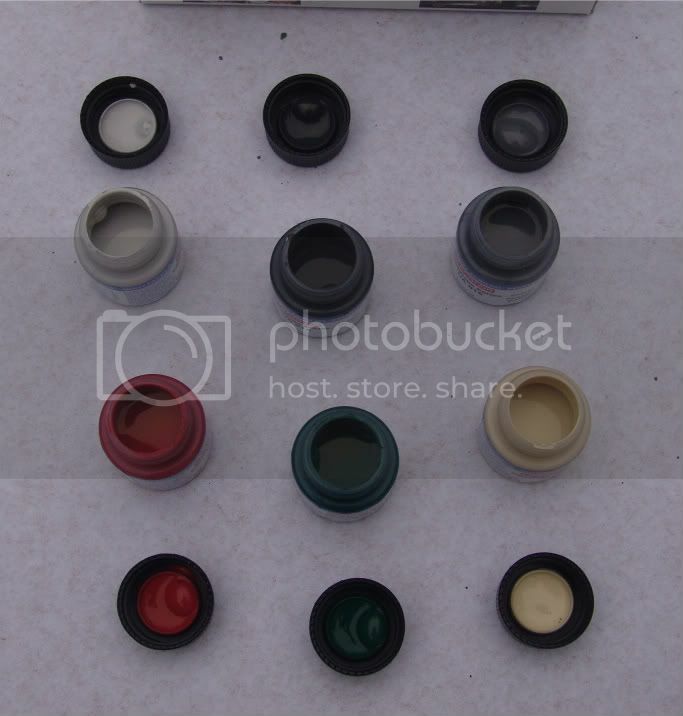 A good comprehensive set that covers the basic camouflage needs and a couple of specific & tricky shades, the red for the ID stripes and the anti-fouling green. Highly recommended for the forthcoming Roma from Trumpeter , and the Italeri MAS boat. 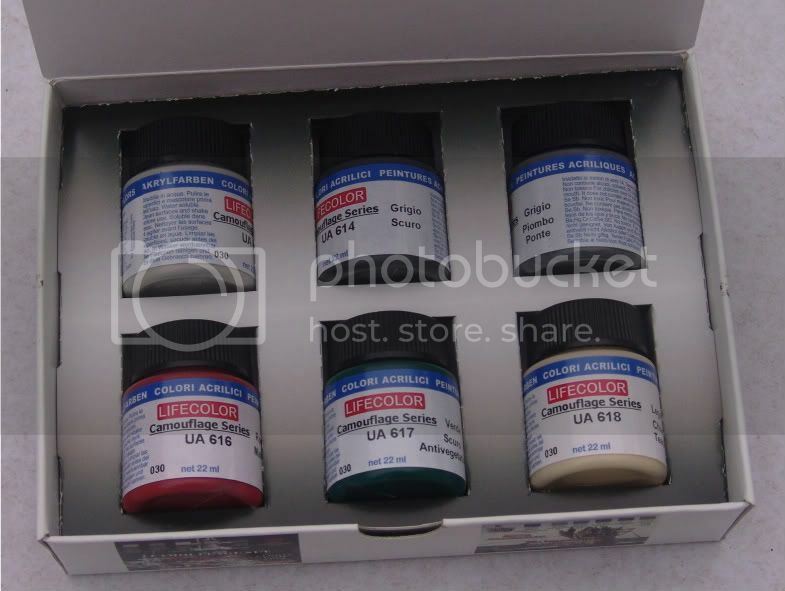 Each set comes in a colourful top opening cardboard box containing six 22ml opaque plastic pots of acrylic paint. The box tops have a photograph of an appropriate vessel or model and colour chips of the six paints included. The back of the box also has colour chips with a brief description of the usage of the colour, and instructions for using the paint with an airbrush, (I found that helpful as I am just getting back into airbrushing and a few hints never go amiss). Also tips for using brush painting. To test the paints (and please excuse the splattering on the test piece that is my lack of skill and no reflection on the paint) I sprayed directly on to an unprimed piece of plastic card. The instructions recommend mixing to the consistency of milk either with lifecolor acrylic thinners or water. I tried both and found both worked well, although the paint seemed to dry a little quicker when thinned with the thinner. The paint adhered to the card well and dried quickly, building up a decent depth of colour in a couple of mist coats and one wet coat. The colours on the test piece are UA 618 from the Regia Marina set, UA 610 from the Kreigsmarine Set 2, and UA606 from the Kreigsmarine set 1. The airbrush clean up between colour was simplicity, as recommended I used Lifecolor Airbrush cleaner, and ran clean water, followed by cleaner, followed by clean water through the airbrush, and went from light to dark to red with no contamination. I also did a small patch with a brush, the paint covers well, and a couple of slightly thinned coats gave a good even depth of colour leaving nothing in the way of brush marks. 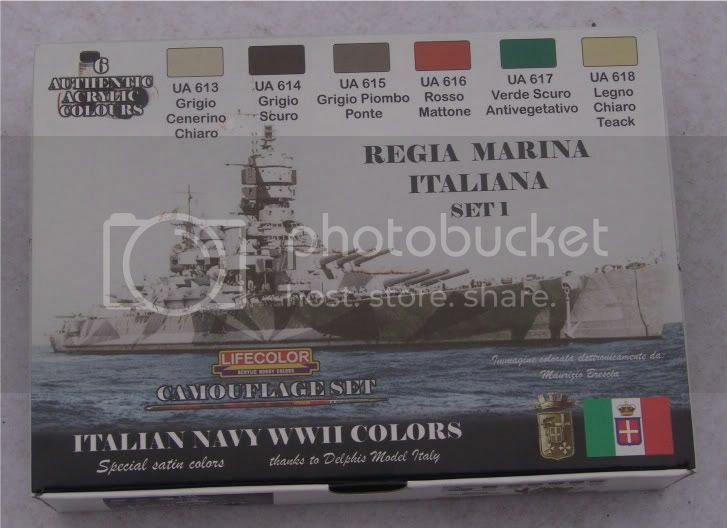 These sets at around £15.95 represent good value for money, the colours are a good match with the colour profiles of Regia Marina vessels in various publications I have, and as I have described above they are user friendly both for airbrush and brush painting. Verdict: Good value and a great to have with the new RM kits coming out. I have added the full size images to the review now.